The 5th Digital Ehon Award will be held simultaneously with the book fair. For details, please visit here for more information. Please check “Entry Details” on how to submit. 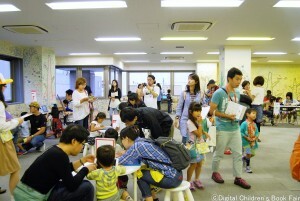 ‘Digital Children’s Book Fair 2015’ was held at Workshop Collection 11 on August 29th (Sat) and 30th (Sun). The event was held on the last weekend of the summer holiday at the two buildings that were expecting to be pulled down. Workshop Collection 11 as well as Digital Children’s Fair Booth ended with great success! For details, please check out our report!